Microsoft has introduced a new app called Tossup for Android phones and the iPhone that allows the users to plan and schedule group meetings and other gatherings. So far several apps have been created, especially for Android users, which provide a proper platform for friends and colleagues to schedule their gatherings and other formal meetings. But now there is a proper polling app known as Tossup App which provides a variety of different planning modes. The app allows friends vote so as to decide where and when to meet. Though the app is primarily meant for scheduling gatherings and meetings, it can also be used for general polling/voting purposes. The main focus of Tossup App is to manage gatherings. In order to use this app, you need to register yourself using your phone number and either your Facebook or email id. After you login, you can generate different questions. You can create questions by using the formal Tossup templates e.g. “where to gather for the Lunch?” or you can write any of your own. The app also suggests nearby restaurants, cafes, bars etc. as a gathering point so as to help you make your decision. 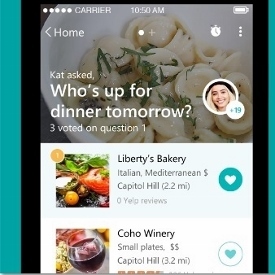 Microsoft has claimed that the app is focused on making “event planning and opinion-gathering a cinch.” People who have to go through the hassle of planning several meetings a week can readily understand the significance of this app . So you can get rid of long email threads and cumbersome conversations and can have the decisions through a simple poll. All you need is to download the Tossup app and let the fun begin. Luckily, another app (web-based) has also been created by Microsoft as a side product which doesn’t require any download.